The government of Antigua and Barbuda is committed to ensuring the health and wellness of citizens and residents of our twin island state. We have sought to do this by providing strong leadership, governance, service provision, adequate and sustainable financing and by fostering public and private sector partnerships. We are currently developing a National Strategic Plan for health and have developed policies and plans in the areas of mental health, aging, non-communicable diseases and health information systems. Recognizing that many of the current public health problems need to be addressed within a legislative framework, we have not only updated legislation to regulate healthcare providers but have also drafted new legislation for tobacco control and food safety. Healthcare services in Antigua and Barbuda are provided through a network of twenty-six community health clinics, one public hospital in Antigua and an eight bed medical facility in Barbuda. The clinics are staffed by a cadre of healthcare workers who utilize the team approach in delivering primary healthcare to citizens and residents. Successes include almost 100% coverage for vaccine preventable diseases. We are committed to the renewal of primary healthcare, a vital component of our health system, which will help to ensure programme sustainability. prevention particularly in the youth as part of its programmes. The Ministry of Health recently established a Public and Private Sector Health Task Force that seeks to improve the relationship between both sectors through frequent dialogue and discussions. It is envisaged that this will lead to improved collaboration on patient referrals, information and data sharing and shared services. The future for small island developing states such as Antigua and Barbuda holds many challenges including reduced financial resources, the negative impacts of globalization and limited human resources. However my government believes that focusing on the social determinants of health, strong political will and continued health system strengthening will help to ensure quality, equitable healthcare for citizens and residents will in turn help to ensure sustainable development. Antigua and Barbuda, at the north of the Leeward Islands in the Eastern Caribbean, is composed of three islands: Antigua, Barbuda (40 km north of Antigua) and Redonda (40 km south-west of Antigua). Antigua comprises six parishes: St George, St John, St Mary, St Paul, St Peter and St Philip. Tropical and drier than most of the West Indies. The hot season, when most rain falls, is May to November. Hurricane Luis, the first hurricane in many decades, struck in mid-1995, causing particular damage to Barbuda where it flooded 75 per cent of the island, including the main town of Codrington. The most significant environmental issue is limited natural freshwater resources, which is aggravated by clearing of trees to increase crop production, causing rainfall to run off quickly. 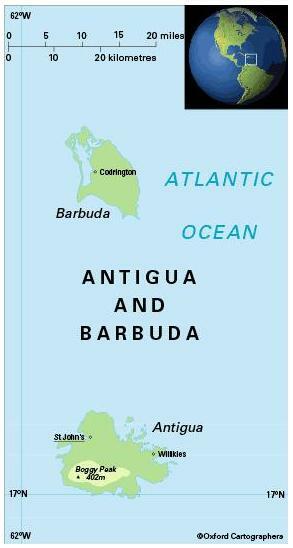 89,000 (2012); some 2,000 of whom reside on Barbuda; 30 per cent of people live in urban areas. The population growth rate stood at 1.7 per cent p.a. between the years of 1990 and 2012. In 2012 the birth rate was 17 per 1,000 people (est. 26 in 1970) and life expectancy was 76 years (est. 67 in 1970). The population is mainly (91 per cent) of African descent (2001 census). Antigua and Barbuda is classified as an upper-middle income economy by the World Bank.